Deciding to use the services of a Geriatric Care Manager is a step towards ensuring that someone is always looking out for your loved one’s health and well-being. 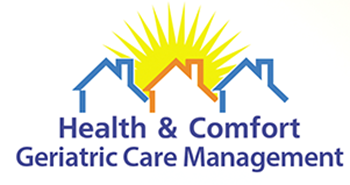 Here at Health and Comfort Geriatric Care Management, whether you need day-to- day assistance or long term planning, our goal is to improve our clients' quality of life, maintain safety, and offer peace of mind to families. Call for a free consultation and find out exactly how a Geriatric Care Manager can help. Our professional and caring team will listen to the reason for your call, assess the immediate and future needs of your loved one, and let you know exactly how you can benefit from geriatric care management services. We will answer any questions you may have and discuss your concerns. One of our trusted and experienced Geriatric Care Managers will travel to you for an in-home assessment so that we can customize a plan that’s right for your loved one. The care plan will provide you with the steps that need to be taken to ensure your loved one's comfort, health and safety is maintained. The care plan will address the issues that you are dealing with and offer creative solutions to resolve those issues in the best way possible. Don't let the worry you have for your aging loved one take over your life. Let us do the worrying for you! The value of geriatric care management services is the peace of mind that it offers family members and the knowledge that your loved one is being taken care of. Our geriatric care managers take pride in the meaningful relationships that we build with our clients and the way that we are able to enhance our clients' quality of life.